Exciting? Maybe not, but you won't find a better tablet for the price. The tablet business has been tough in recent years, but last year Apple found a hit in its low-cost iPad. Its admirable performance and battery life made up for its lack of frills, and that $329 price tag certainly didn't hurt, either. Apple saw its iPad sales grow year-over-year for the first time in ages after its release, all but ensuring we'd get a sequel — and here we are. Apple spent most of its time at a launch event in Chicago lauding this year's $329 iPad ($299 with that education discount) as a great machine for kids in classrooms. I won't dig into that too much in this review — there are people far more qualified than I to explore the relative merits of iOS versus Chrome OS in schools. While the iPad's announcement explored its use almost exclusively as a classroom tool, it's a lot more than that. In fact, just like the iPad we got this time last year, Apple's latest is the best budget tablet you can buy right now. Once again, Apple has squeezed a bunch of components from past iOS devices -- the processor from the iPhone 7, the Pencil-friendly touch sensor from the first iPad Pro -- into a familiar body. While that might not sound terribly exciting, it all comes together to offer one of the most pleasant experiences you'll find from a sub-$500 tablet. Whether schools will embrace this machine as enthusiastically as Apple hopes remains to be seen, but it's the best cheap iPad Apple has ever made and there's enough performance and polish here for everyone. 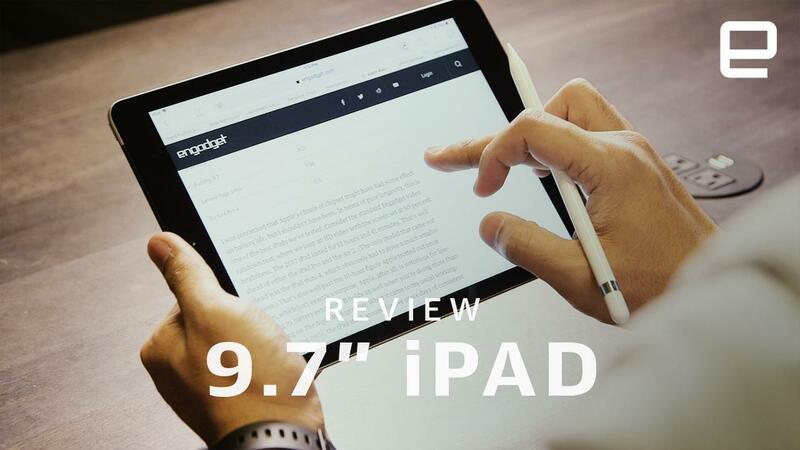 Be the first to review the iPad (2018)? No, I swear I'm not reusing photos — the 2018 iPad looks identical to last year's model, which in turn looks like 2013's iPad Air with a Touch ID sensor. For those who haven't been keeping track, that means we're working with an aluminum body that's 7.5mm thick and weighs just a hair over 1 pound. It would've been nice if Apple could've shaved a few fractions of a millimeter off the iPad's waistline to match its slimmer Pro-series tablets, but that's a pretty minor complaint. It's not as if the 2018 model is uncomfortable to hold for prolonged periods of time. The volume keys, headphone jack and nanoSIM slot (on the LTE model) are all exactly where they've been for years, and they all work exactly the way they're intended to. This design is arguably a classic, but a few more modern flourishes couldn't have hurt. The 8-megapixel camera around back is adequate for the occasional snapshot, but considering how strongly Apple played up the importance of "creating" during its education-focused launch event, a camera pulled from a more modern iPhone would've been nice. Having a Smart Connector (like the one that graces the left side of every iPad Pro) here would also have been really helpful. Students and adults alike would've benefitted from the ability to magnetically attach accessories like keyboards to their inexpensive tablets, but hey — the company has to keep its Pro line special somehow. And my biggest quibble with the 2017 iPad is back: the noticeable gap between the 9.7-inch Retina display and the glass that covers it. Apple's Pro line eliminates that gap by bonding those two elements together, which makes for a slimmer design and eliminates the hollow, plasticky feeling you'll notice when poking at the screen. If you're coming to this iPad from a much older model, though, this might not seem like a big deal. After all, the Retina display still renders text and images crisply and gives colors a pleasant amount of verve, even under the warm Spring sun. Could this iPad have been made better with a few slightly different design choices? Certainly. Pencil support aside, this is about as by-the-book as Apple hardware updates get. For the price, though, it's hard to complain about the minor issues and omissions here. As I mentioned before, the iPad runs with an A10 Fusion chipset that pairs two high-performance CPU cores with two energy efficient cores for less strenuous tasks. These chipsets were plenty impressive in the iPhone 7 and 7 Plus and they continue to do great work here, too. In fact, with the A10 Fusion in place, this cheap tablet has more computing power on offer than the first two iPad Pros. If Apple's presentation in Chicago was any clue, it wants kids to use that horsepower to dissect virtual frogs and learn about the world around them using augmented reality. That all worked well enough, both in Apple's demo areas and in my own testing. Kids will have a blast using the 2018 iPad... assuming they attend a school well-heeled enough to afford them. Of course, the benefits of a more-powerful chipset in a tablet like this are clear to everyone, not just those toiling away in school. I've spent a little more time than I care to admit whipping through matches in PUBG Mobile with the graphics cranked up too high, and the iPad kept up without a single hiccup. (Pro tip: Don't try to use the Apple Pencil to aim.) Ditto for Drake's jam Fortnite, which similarly runs like a charm. When it came time to actually get work done, I found I could seamlessly jump between multiple apps and run them side-by-side without so much as a stutter. More importantly, the 2018 iPad is an excellent vessel for iOS 11.3 and its multitude of tablet-specific features. When I tested the iPad last year, iOS 11 hadn't arrived yet, so this is the first opportunity I've had to try Apple's relatively new interface on a low-cost tablet. In short, it feels great. The company has said the iPad represents its vision for the future of personal computing, and with iOS 11 on-board, even a budget machine like this could feasibly fill the role served by a traditional PC for some. Apple's iPad Pros may wring much more power out of their chipsets, but to my surprise, this $329 tablet often felt just as fast at most tasks. Not bad at all for a budget machine. You won't need to worry too much about battery life, either. As always, Apple claims you'll be able to get "10 hours of battery life on a single charge," and always, the company is low-balling it. In our video playback tests (looping an HD movie with screen brightness set to 50 percent), the iPad routinely lasted 1.5 to 2 hours more than Apple's estimate. Apple's Pencil has been around for over two years now, it has changed very little since the day it launched. For the most part, that's a good thing: its pressure sensitivity and tilt detection make it an elegant, capable companion for artists and ardent note-takers. But does it work as well here as on an iPad that costs twice as much? Unless you're a professional digital artist, the answer is "yes." I've never had much of an eye for art, but our video producer Brian Oh -- an Apple Pencil neophyte, mind you — found doodling on the 2018 iPad surprisingly pleasant. Ditto for the handful of children I yielded the iPad to over Easter weekend, though their work was largely lacking in, err, artistic integrity. Meanwhile, I spent most of my time with the Pencil jotting down quick notes marking up documents with Pages' new smart annotations and found nothing amiss. The only real difference between using the Pencil on a $650 iPad Pro 10.5 and on a tablet that costs half that is the way it feels. The gap between the Retina display and the glass covering it means the pencil makes a more pronounced plunking sound than an iPad Pro when you tap the screen with it. Otherwise, it works as well as the first batch of Pros Apple released -- you know, the ones before Apple started including 120Hz ProMotion displays. To be clear though, most people won't need to splurge on an Apple Pencil. I've loved my time with it, and it's undeniably useful, but I can't say its blend of utility and price is worth $99 for most people. (Sadly, the $50 Logitech Crayon unveiled in Chicago will be sold exclusively to educators). If nothing else, the Pencil's journey down-market may offer a bit of insight into the future of the iPad Pro. After all, the Pencil was one of the Pro line's marquee features; now that anyone who buys a new iPad can use one, it stands to reason that other factors will soon differentiate the Pro from Apple's basic tablet. All of a sudden, rumors of iPad Pros with notches and even larger screens don't just sound plausible — they seem probable. 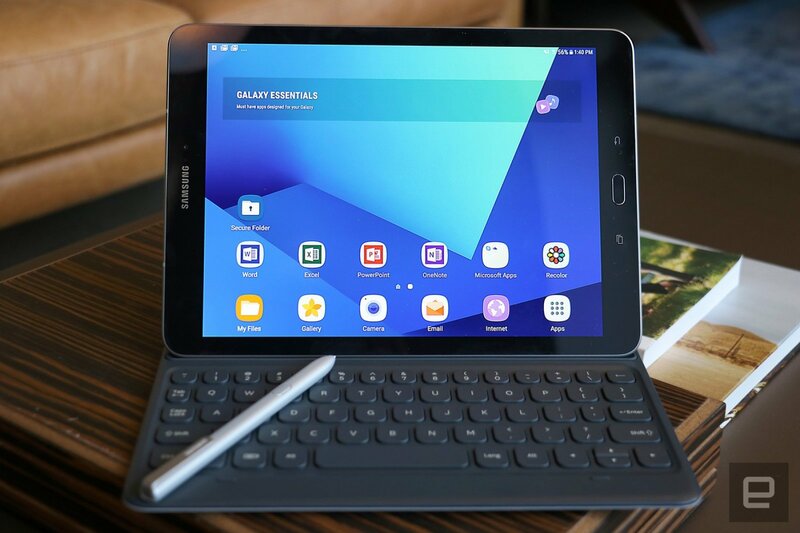 There's still some relatively lively competition in the premium tablet space, but down here in the budget zone, truly good options are harder to come by. If you're not sold on the 2018 iPad, you may want to consider something like Samsung's Galaxy Tab S3. Sure, it came out last year, but it packs an absolutely gorgeous 9.7-inch Super AMOLED display and a thinner frame than the iPad. At $449 it's more expensive than the standard iPad, but it also comes with one of Samsung's S Pens right in the box for note-taking and sketching. Some will also welcome the ability to magnetically attach a keyboard, though in our experience, Samsung's keyboard is pretty lousy. If kicking back with a movie on a tablet is more your speed, the iPad might be overkill. Something like Amazon's surprisingly decent Fire 10 HD tablet may fit the bill better. It lacks access to Google's services, but it's quicker than we anticipated and its 1080p screen was nicer than we're used to from Amazon. And the best part? It's really cheap -- just $150 for the base 32GB model. Meanwhile, Acer was the first company to unveil a tablet powered by Google's Chrome OS. The timing of Acer's announcement was seemingly chosen to take some of the wind out of Apple's sales, and it's mostly a play for classrooms, but Chrome OS is plenty capable if you have modest needs. Alas, it'll still be a few weeks before we get to take the $329 Chromebook Tab 10 out for a spin. It's too early to tell what sort of impact the 2018 iPad will have in schools — while it might have the edge in education apps, the iPad is still more expensive than most of the Chromebooks you'll find floating around school corridors. Outside of those hallowed halls, though, the 2018 iPad's appeal is much clearer. Sure, you could easily spend less money on a tablet if you wanted to, and you couldn't exactly call this iPad "exciting." Even so, its potent combination of price, polish and power make this iPad the best value tablet money can buy.